This article is about the move usable in most mainstream Mario games. For the secret places from certain levels in Super Mario 64 and Super Mario 64 DS, see Slide (Super Mario 64). The Slide (sometimes called sliding down a slope[page number needed] and also called Slope Slide) is a move triggered by crouching on a slope. In 2D Mario platformers, it is generally used to increase the character's momentum or to knock out enemies that stand in the way. The player can also slide in 3D platformers, although in most of them it is automatically triggered upon landing on a steep slope and is intended to keep the player from accessing certain areas, rather than as a form of attack. This move first appears in Super Mario Bros. 3 and reappears in many Mario games. The character sits and slides down the hill while gaining speed (they go even faster on icy slopes); they are invincible to most enemies while sliding, though they become vulnerable again upon stopping. Also, characters can do a midair jump by sliding into midair and jumping. In Super Mario Bros. 3, Frog Mario and Hammer Mario cannot slide. In Super Mario World, it is also possible to slide up a hill by crouching while running up one. Beach Koopas are also capable of sliding against Mario. As of New Super Mario Bros., sliding has the same point chain as Invincible Mario. Super Mario 3D World is the first 3D platformer to implement sliding as a form of attack. In Super Mario Run, when Mario walks on a slope, he will slide automatically. 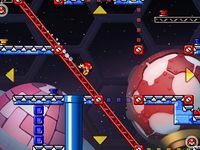 A Mini Mario sliding down a Red Girder slope in Mario vs. Donkey Kong: Tipping Stars. In Mario vs. Donkey Kong: Mini-Land Mayhem!, Mario vs. Donkey Kong: Tipping Stars and Mini Mario & Friends: amiibo Challenge, steep slopes cause the Minis to slide down uncontrollably. 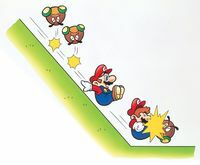 Sliding can sometimes be used to attack enemies, such as Shy Guys, Pokeys and Cursed Mini Marios, or dispel fragile Rock blocks. Slopes of any material (ground or Red Girder) can also attenuate long-distance falls, making the toy slide on it instead of breaking on contact. In general, Minis cannot climb uphill slopes and turn in the other direction shortly after they encounter one; however, Mini DK's Quick Climb ability in Mini Mario & Friends: amiibo Challenge allows the toy to run up slopes of any angle. This page was last edited on March 30, 2019, at 18:49.